On his new album, “The Big Fix,” Raleigh, N.C.-based singer-songwriter Steve Hartsoe taps the Americana and British Invasion wellspring that nourished his formative musical years in the San Francisco Bay Area. The former AP journalist delivers a diverse mix of rootsy songs about love, loss and languor, propelled by gritty guitars, strained vocals and groove-tight rhythms. From the opening rocker “Salt and Wine” to the closing Dawes-flavored modern folk of “SLO (California),” the songs fit together because the writer has been around a while and experienced the crucible of life — lost jobs, death, wayward family members and birth. Those experiences translate into a refreshing honesty throughout the album. Or, as one writer sees it: “Steve Hartsoe sings with the conviction of a nomad bleeding his heart dry, performing for anyone from the side of a boxcar,” attests writer Richard Murray from POW Magazine in San Francisco. “It’s been too long since we’ve heard Americana this genuine. Inspired by Tom Petty and Ryan Adams, Steve Hartsoe is full of melodic spirit and gruff guitar lines. Like a firm handshake and a warm smile, this song makes a great first impression” (Milk Crater). 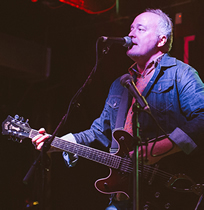 Hartsoe honed his musical skills fronting an alternative rock band in the San Francisco area in the 1980s and ‘90s while sharing the bill with such notable artists as Chris Isaak, Todd Rundgren, Mudhoney, Young Fresh Fellows and, later as a solo artist, with Dan Vickrey (now of Counting Crows). San Jose-based London Down (later, The Raging Marys) released two critically acclaimed albums, charted in France and toured from Portland to Santa Barbara. After the band’s demise, Hartsoe began playing as a solo artist at clubs, cafes and churches around central and northern California.